Fully-automated, driverless driving in the city requires the highest level of functional safety. Bosch and Daimler possess know-how from the individual component and the entire vehicle to the operator model. US technology company Nvidia supplies the platform for AI algorithms from Bosch and Daimler. Stuttgart – Bosch and Daimler are speeding up the development of fully-automated and driverless driving (SAE Level 4/5) in the city and are decisively setting the course. The partners have chosen California as the pilot location for the first test fleet. In the second half of 2019, Bosch and Daimler will offer customers a shuttle service with automated vehicles on selected routes in a Californian metropolis. Daimler Mobility Services is envisaged as the operator of this test fleet and the app-based mobility service. The pilot project will demonstrate how mobility services such as car sharing (car2go), ride-hailing (mytaxi) and multi-modal platforms (moovel) can be intelligently connected to shape the future of mobility. In addition, the partners have decided on the US technology company Nvidia as the supplier of the artificial intelligence platform as part of their control unit network. A decisive factor for fully-automated and driverless driving in an urban environment is the reliable recognition of the vehicle’s surroundings with the aid of various sensors. Analyzing and interpreting the variety of incoming data and translating them into driving commands within a very short time requires enormous computing power – the fully-automated, driverless vehicle will be a mobile super-computer. 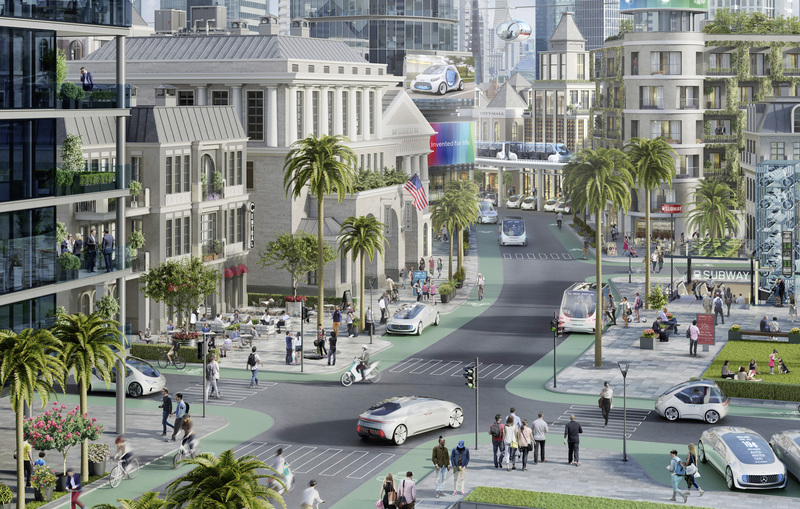 At the same time, fully-automated, driverless driving in the city requires a versatile, redundant systems architecture and the highest level of functional safety. To achieve this level of safety, the necessary computing operations are performed in parallel in different circuits. This means that the system has instant recourse to these parallel computing results when necessary. For their driving system, Bosch and Daimler thus rely on a control unit network made up of several individual control units. The US technology company Nvidia supplies the platform required for this, which can run the Artificial Intelligence (AI) algorithms generated by Bosch and Daimler for the vehicle’s movement. 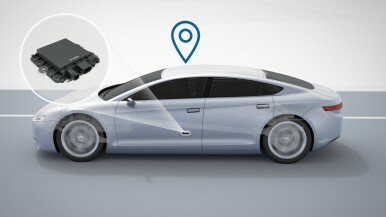 The network of control units collates the data from all sensors with radar, video, lidar and ultrasound technology (sensor data fusion), evaluates them within milliseconds and plans the movements of the vehicle. All in all, the control unit network has a computing capacity of hundreds of trillion operations per second. That’s as much as several S-Class vehicles together could reach just a few years ago. 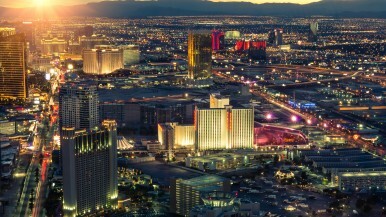 Metropolis in California will be a pilot city for automated test fleet The control unit network will also be used in the fleet vehicles which Daimler and Bosch will put on the roads of California in the second half of 2019. Not only that: Both partners will offer customers an automated shuttle service on select routes in a city located in the San Francisco Bay in Silicon Valley. The test operation will provide information about how fully-automated and driverless vehicles can be integrated into a multi-modal transport network. Many cities face numerous challenges that are increasingly burdening the existing transport system. The test is to show how this new technology might be a solution to these challenges. The personnel in this cooperation are jointly developing the concepts and algorithms for the fully-automated, driverless drive system. Daimler's task is to bring the drive system into the car. To this end, the company is providing the necessary development vehicles, test facilities and later the vehicles for the test fleet. 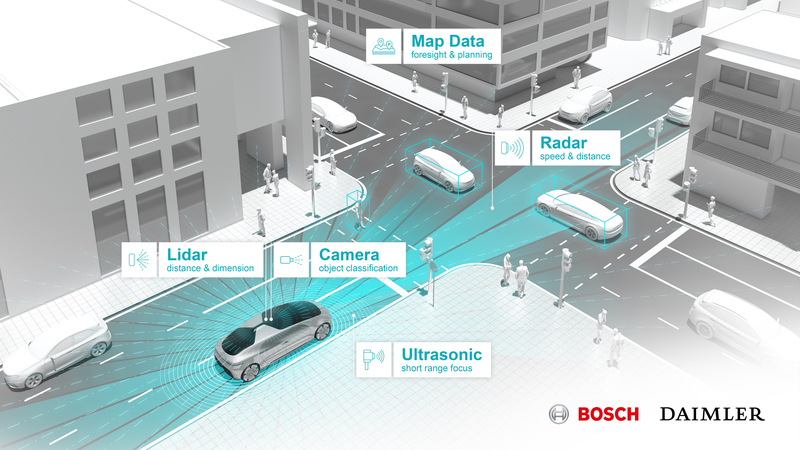 Bosch is responsible for the components (sensors, actuators and control units) specified during the development work. For test purposes the partners use their laboratories and test rigs, plus their respective test sites in Immendingen and Boxberg. Furthermore, since 2014 Mercedes-Benz has approval to test automated vehicles in the Sunnyvale/California region. The company also has comparable approval for the Sindelfingen/Böblingen region since 2016. Bosch was the world’s first automotive supplier to test automated driving on public roads in Germany and in the US in early 2013.